Most of learners came from Italian background however we had one Latvian learner. They were professionals in their fields so level of education was high. Our learners had reasonable ICT skills but not much of on-line learning experience. Some of them used paper dictionary or Google translate. The learner came here for training purpose as a part of the European project. You can say they were our experiment group because on a local level we had almost concluded the delivery with other learners and it was hard to schedule anything due to summer break approaching fast so we had to use alternative option. The important thing is that they enjoyed the English lessons and learning about new resources/tools to improve their English language. Course venue: Community Action Dacorum conference room and St Mary’s church. We had to use 2 locations because we could not find a hall which was suitable for our timetable. Course material: Scheme of Work, Lesson Planning, European project application, glossary related to project application. 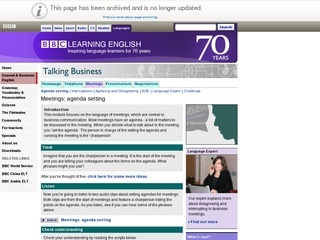 On-line resource BBC learn english.r. The course ran over a period of four days and 2 hours per lesson however most of the time the course ran over due to keen engagement of learners. The learner’s knowledge of language was B1 – C1. The course was prepared and delivered through Creative learning which is part of Community Action Dacorum. The course material was prepared by keeping topic and learning objectives of learners in mind. The course material covered using European Projects application form, glossary related to EU projects, on-line resource. Wide board and flip charts also were used. The course was taught by a qualified teacher for English as a foreign language using interactive approach. The course was aimed at providing participant business English knowledge because they were professional as well as improving their English speaking skills. The lesson plan is comprehensive and advantageous for first time users of the link, although there could be other ways to use this resource. It would be advantageous for the LP could have the total time at the beginning ie 1h45mins so tutors know how long to allow at first glance of the LP. The first activity talks about objectives, but it is not clear if talking about course objectives or lesson objectives. More clarity/explanation is required to differentiate between the class activity and the homework activity: class activity – “to create a short guide for speakers of other languages who wish to participate in meetings”; homework activity – “to create a short guide for how to participate in meetings for someone who has just moved to the UK”. 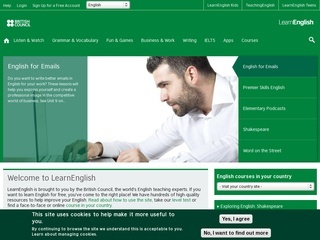 Very useful for helping to choose an online resource. Could be a challenge to keep up today as some web pages get archived (as in part of the resource in question). A great starting point in terms of the filters offered. Accessible to all. Again, maintaining accurate information is essential if tutors are revisiting resources. I found the BBC website very easy to use with good quality resources for designing a lesson around. The students all seemed to respond well to the resources also. Whilst there are alternatives to the toolbox it is often difficult to find quality lesson plans using quality resources (and often some websites want to charge you for the service). I found that the mall guide tools was an effective way to find websites that you would not normally come across during a normal google search but that offered quality language learning tools (I trialed a website for learning Italian and it had a range of quality grammar exercises which all can be done online). Overall I think the lesson plans, resources and materials are all helpful in generating and supporting new ideas and approaches to language learning.